Central Government Jobs 2019 are one of the most trending jobs in India. Many of the people are showing their interest in Government Jobs, especially in Central Government Sector. At present, there are many Vacancies are available in various organizations. The Government Jobs provide the job security and also candidates can receive the high salary package. Many of the Unemployed aspirants are jobless and all of them are seeking for latest Central Government Jobs 2019. For those people, the current page is the best chance to check out the latest Central Govt Jobs 2019. In the below section, we have given the Central Govt Jobs in India 2019. There are many Central Government Job Departments such as Railways, Banks, Defence, Army, Navy, Teaching, Airways, Miniratna, Maharatna, Navaratna etc want to select the capable contenders into their organization. Those who have completed their 10th, 12th, Diploma, BE, B.Tech, Graduate, Post Graduates, MBBS, MD, BDS, B.Com. BS.c, B.Pharm, MCA, ME, M.Tech, MBA, M.Com, MA, BA reached the correct place to find out latest Central Government Jobs 2019. 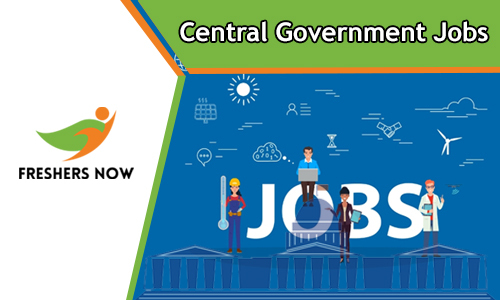 For those people who are looking for the Central Government Jobs, the current article gives the complete details about the latest and upcoming Central Govt Jobs 2019 various sectors such as banks, Govt jobs in the railway and much more openings. Moreover, below you will get the Jobs related to Central Government as well as Central Government Jobs for Graduates too. Well, all the job hunters know that the Central Government employees gets a plenty of advantages. Some of the major benefits are medical facilities, loan facilities, bonus etc Also, there is a pension benefits of the Central Govt employees. After the retirement of central govt employees, they can receive half of her/ his salary as a pension. When employee death their wife gets the pension. At current situation, there are a lot of central government jobs for graduates, Central Govt Jobs for Engineers 2019, Railway Jobs 2019, Bank Jobs 2019 and much more. Nowadays there is a high demand for the Central Government Jobs 2019. This year many of the organizations are about to release huge recruitments. For the sake of candidates stick with this page and get further more details. Many of the candidates these days are choosing Government Jobs over private jobs that too particularly Central Government Jobs. Even though an immense number of younger generation people are interested in Central Government Jobs 2019. There is a huge crowd of students searching for Latest Central Govt Job Openings 2019. These days many of the job seekers are dreaming the break and relax work schedule. For those candidates, the Central Govt Jobs 2019 is the best one. So choose your career as a central government employee and enjoy the benefits. The Central Govt Jobs are always in demand in India. Mainly, contenders can get the financial security. Many of the Posts like Engineers/ Officers, Assistant Officer, Executive Trainee, Relationship Manager, Graduate Executive Trainee , General Manager, Assistant Engineer, Chemist,, Canteen Attendants, Director, Steno, Fireman, Cook, Section Officer, Deputy Director, Accountant, Senior Accounts Officer, Junior Accountant, Assistant, Staff Car Driver, Junior Engineer and other are available in various departments. Our main suggestion to the candidates is before applying for any post related to Central Government Jobs 2019 it’s better to verify all the mandatory details such as Education Qualification, Application fee, Age limit, Age relaxation very carefully and also refer the pay scale, grade pay, post wise vacancy details, category wise application fee details, procedure to apply for the recruitment and get some idea about the application process and proceed for the further step. Also, we want to share the pretty much information that is about the competition level. You have to clear some of the selection rounds such as a written exam, physical test, skill test, viva voice, document verification, Group discussions and interview. But some of the organizations select the candidates based on their merit. So make sure whether the applying post is suitable for you or not. After completion of your application process, immediately you have to concentrate on your preparation. Because the written exam is more difficult. Without knowing about the Exam Pattern, Syllabus along with the Previous Year Question Papers. You can check all the subject wise syllabus and old papers in a pdf format. So download it according to your convenience and prepare well. One more instruction to the aspirants is before attending for the written exam please carry valid Admit Card to the examination hall. Without the Hall Ticket, no one cant be permitted to attend into the examination hall. Also, on our website check the Results. Through this page, we have gathered day to day notifications. And all the details have bundled here so check them and apply before the closing date. The late applications are rejected by the departments. So take a look at the above updated latest Central Government Jobs 2019 table. We create this page for the job seekers who are looking for Central Government Jobs 2019. Get the latest Central Govt Job Vacancies 2019 from this page at free of cost. Also, both Fresher, as well as Experienced contenders, can apply for the openings. Getting a Central Government Job is not a piece of cake. On the other hand, many of the central government organizations are selecting the people only on contract basis. You can also check the contract based Central Govt Jobs 2019 from this page. So we suggest to the contenders choose based on your education qualification wise. And also Central Government Jobs are permanent. Hence, candidates no need to worry about their job. This is all safe and also the work should be normal when compared to the private jobs. Not only current notifications, we are also providing the upcoming Central Government Jobs 2019 on this page. So kick start your career as the employee in Central Govt sector. People of SC, ST, BC, Personal with disabilities had a chance to get the central government jobs easily as they are having the reservation. But the OC people need to work hard to get a job in Central Government. Most of the Indian citizens are searching for Central Govt Jobs 2019. We are also suggesting the job fighters can apply for recruitments and fulfill your dream. A career in the Central Government is tough in some of the initial stages. But still, you can earn a good salary. We have collected a bunch of information and shared on this page. Interested one can utilize the current page and proceed. We are always here for the sake of people to help there in a correct way. Keep visiting our website and get the latest Central Government Jobs 2019 and apply for available Vacancies. To get more specific information bookmark this page. And keep an eye on www.freshersnow.com to find the recent recruitment notifications. This is the exact place to check all the recent updates. To get more genuine information please visit our website. Along with Central Govt Jobs contenders can also check the State wise Government Jobs on our website. We hope the details given on this page might help the job seekers and job hunters. So look at this page and find out the much more recent updates.